(Bloomberg) -- The Senate blocked Democrats’ Green New Deal, as Majority Leader Mitch McConnell attempted to force the party’s presidential contenders into an embarrassing vote over a far-reaching and costly climate-change proposal that Republicans say voters will oppose. The vote Tuesday was 0-57 with 43 Democrats voting present, including the Senate’s half-dozen presidential candidates, to sidestep the GOP maneuver and buy time to build their campaign positions. The vote is just the first step by Republicans to put the Green New Deal in the spotlight. The proposal -- mostly a collection of goals for mitigating climate change rather than a fully formed plan of action -- has been a favorite target for criticism by McConnell and Republicans since freshman Representative Alexandria Ocasio-Cortez of New York and Senator Ed Markey of Massachusetts rolled it out in February. Voting with Republicans against the resolution were Democrats Kyrsten Sinema of Arizona, Joe Manchin of West Virginia, and Doug Jones of Alabama, who faces a tough re-election campaign next year in a deep-red state. Independent Angus King of Maine, a member of the Democratic caucus, also voted against the measure. The Green New Deal has more than 100 congressional Democrats as co-sponsors, including the six senators running for president. While Democrats are united on the need for significant action to stem climate change, they don’t agree on specific proposals. McConnell introduced his own version, drawing on the language of the Democratic measure. Senate Minority Leader Chuck Schumer of New York worked to shield Democrats from having to expose splits between moderates and progressives on the issue. He dismissed the vote as “gotcha politics” intended by Republicans to distract from the fact that they don’t have their own plan to curb greenhouse gas emissions. McConnell said he believes climate change is real, but the question is how to deal with it. In the House, majority Democrats plan to introduce a resolution this week that calls for the U.S. to remain part of the Paris Climate Accord and requires the Trump administration to create a plan to meet its emission reduction goal, according to a senior Democratic aide. Trump gave notice in 2017 that he intends to pull out of the Paris agreement, under which the U.S. pledged to reduce greenhouse gas emissions by at least 26 percent from 2005 levels by 2025. Senate Democrats weren’t under any real pressure from outside progressive groups to vote for the Green New Deal at this point. Adam Green, a co-founder of the grassroots Progressive Change Campaign Committee, said McConnell was trying to force some “no” votes at a time when Democrats are still reviewing the plan. Voting “present” shows that Democrats aren’t going to hamper things with an early dissent, he said. The six Democratic presidential contenders, all of whom voted present, are Cory Booker of New Jersey, Elizabeth Warren of Massachusetts, Kamala Harris of California, Kirsten Gillibrand of New York, Bernie Sanders of Vermont and Amy Klobuchar of Minnesota. McConnell has accused Democrats of wanting to ban “anything with a motor that runs on gasoline” and embracing “garden variety 20th century socialism” at a cost of tens of trillions of dollars. 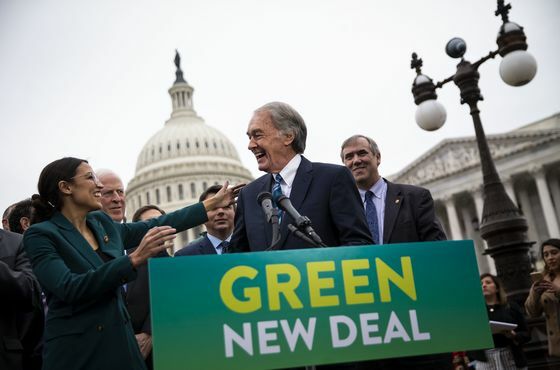 Senate Democrats including Gillibrand and Markey appeared at a Green New Deal rally with environmentalists outside the Capitol before the Senate vote, expressing confidence that 2020 voters will support action on the issue.